Oliver Namayanja is funny! She enjoys acting like a comedian and making her friends laugh. Oliver comes from a family of eight children who are being raised alone by their mother after the departure of their father. By the time Oliver joined Cosma Foundation, she had dropped out of school, but with Cosma’s help she is now on track to be the third in her family to complete formal schooling. Her mother is also getting support from Cosma’s Agriculture program, to try and improve the family’s farming income. At school, Oliver likes mathematics, science and English, along with netball and dancing. However, what she’d really like to do when she finishes her studies is become a comedian. 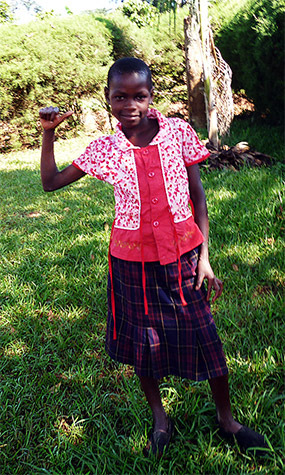 “If I make money,” she says, “I will help my younger siblings by paying their school fees. I’ll also buy nice clothes for my mother.” For now, she helps out at home by cooking and helping at the farm. She sings often, and loves to give out small gifts like photos, avocados, and bananas to her friends.